Horner, Prior John Michael Stuart Timothy, O.S.B. Fortified with the sacraments of Holy Mother Church, Friday, April 27, 2018. Founding monk of Saint Louis Abbey and founding headmaster of Saint Louis Priory School. 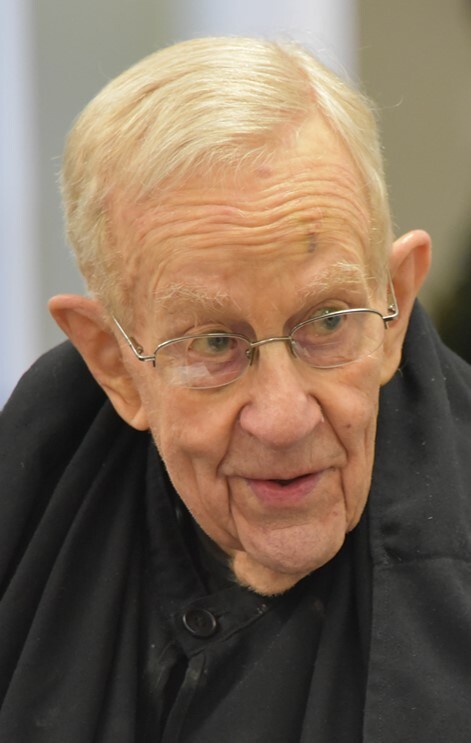 Beloved and esteemed brother of the monks of Saint Louis Abbey, former pastor of Saint Anselm Parish, author and translator, counselor and friend to many. Born in Quetta, India, August 24, 1920, John Michael Horner served in the British Army in the Second World War and was clothed as a monk at Ampleforth Abbey in 1946. He was ordained to the priesthood in 1953. In 1955 he was one of three monks sent from Ampleforth to found a monastery in Saint Louis. The following year he opened the Saint Louis Priory School and served as headmaster until 1974. From 1981 to 1995 he served as the pastor of Saint Anselm Parish. In his later years he continued in active pastoral care for the members of the Abbey Family. To his fellow monks he was a model of patience and perseverance in monastic life always with a ready cheerfulness. Services: The body will be received at Saint Louis Abbey, 500 S. Mason Rd., Creve Coeur at 6:00 p.m. Friday, May 4. An all-night vigil of silent prayer will be kept with the body in the Church. Those wishing to pay their respects are welcome from 6:00 p.m. until the funeral Mass at 10:00 a.m. Saturday, May 5. Burial will follow immediately in the cemetery adjacent to the Abbey monastery. Reception will follow in the monastery. The body will be received at Saint Louis Abbey, 500 S. Mason Rd., Creve Coeur at 6:00 p.m. Friday, May 4. An all-night vigil of silent prayer will be kept with the body in the Church. Those wishing to pay their respects are welcome from 6:00 p.m. until the funeral Mass at 10:00 a.m. Saturday, May 5. Burial will follow immediately in the cemetery adjacent to the Abbey monastery. Reception will follow in the monastery. The KNIGHTS OF COLUMBUS of Metro St. Louis extend their deepest prayerful sympathy to the monks and brothers of ST. LOUIS PRIORY and the parishioners.of ST. ANSELM Parish on the passing of founding Priory H.S. Prior Fr. TIMOTHY JOHN HORNER, OSB. During his lengthy service to Priory H.S. as a founding faculty member/administrator, as well as the Abbey and St. Anselm Parish, Fr. Timothy exemplified the best of the Benedictine charisms of faith, scholarship, and service during his long priesthood. May God Grant Him Eternal Rest in the company of St. Benedict and all the Saints–and know of the Knights prayerful remembrance of his confreres and the Priory/St. Anselm families he served so faithfully! As a young man of 17 years old I lived in the monastery for three months along with Fr. Columba, Fr. Luke, Fr. Ian, and Fr. Timothy. I was one of the first three postulants of Priory along with John Brod Peters and Paul Bryant. The latter two did not live at Priory and they went directly to Ampleforth Abbey for their postulancy. I alone did a postulancy – so to speak – at Priory before going to do one at Ampleforth. John Brod Peters had two Master Degrees and Paul Bryant had just received his Ph.d in Science. I at that time had only three years of high school. During my three months living at Priory in Switzer House in 1957 or ’56, I was tutored by Fr. Timothy in church Latin. He was always quite helpful in spite of a heavy work load in arranging for the new school..
in the rear of the Switzer pile and wherein I sometimes would help Timothy sort gifted books for the school library. When I once dropped a book he regretted that I had aged it by 20 years. He was indeed a true educator and teacher. My fond memories of Luke, Colomba, Ian , and alas of Timothy are indeed joyful ones. Eternal rest grant unto him! Let the perpetual light shine upon him! My sincere condolences to the Benedictine Community. Fr. Timothy was compassionate, forthright, humble, inspirational, and always walked in the steps of the “Good Shepherd “!